Okay, so technically it wasn’t a date night, it was more of a date afternoon… but that just sounds weird. In any case, last Saturday, the Bulgarian and I attended an Italian cooking class in Acton Town and had SO much fun. A little while ago, we signed up to this site called Wonderush – there was an offer on Wowcher for £9 for two months, and it seemed pretty cool so we thought we’d give it a go. The idea of the site is that it’s a monthly subscription, £29 a month at full price, and with that, you can go to as many activities as you can get a place on. There’s lots of different kinds of things, from exercise classes to arts and crafts. The exercise classes seem to always have spots available, but the food classes and the arts and crafts go super quickly. The only downside is that most of these classes are a fair way out of central London. We went to a pottery class a few weeks ago that was an almighty trek to get to. The cooking classes were thankfully just one tube line away. The classes were run by Silvana at Tutti a Tavola, who is honestly, one of the loveliest ladies ever. She’s such a happy, smiley person and you can really tell how much she loves what she teaches. 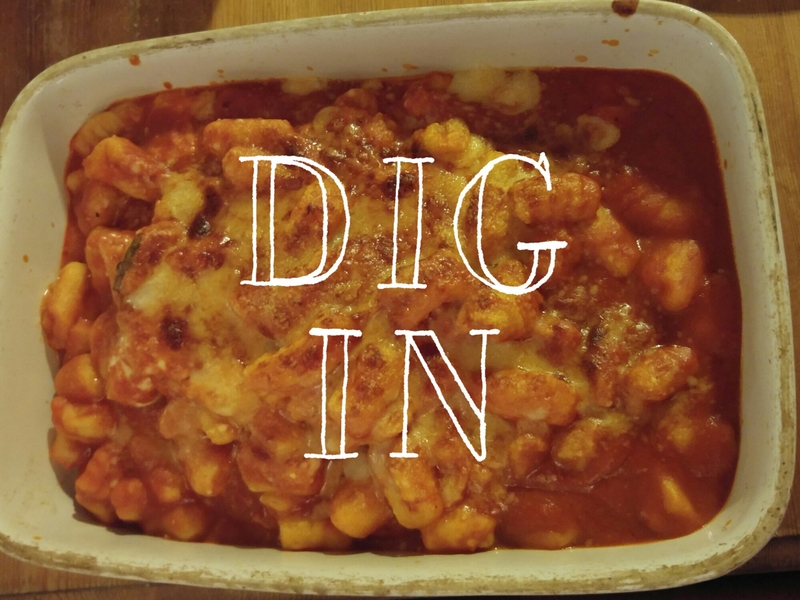 She changes her course content every month, and this month’s dish was gnocchi – one of my favourites! Silvana provided all the equipment and ingredients. 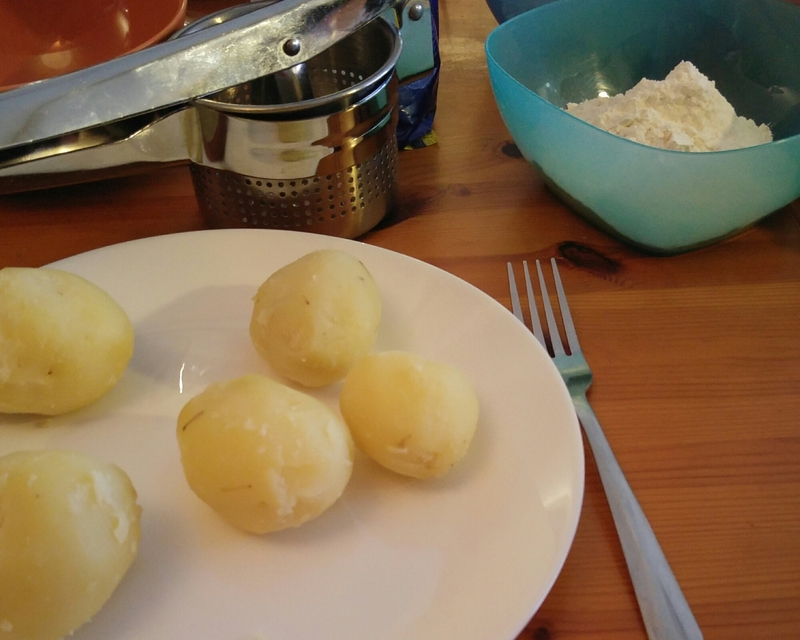 The classes take part at long tables in a really sweet Italian restaurant on Gunnersbury Lane, so no cooking is involved, Silvana took care of pre-boiling the potatoes for the gnocchi and getting everyone’s efforts to the kitchen when we were finished. As we worked, Silvana gave us some useful tips, like to always ensure we make gnocchi at room temperature (they don’t like the cold!) and not to overwork the mixture. 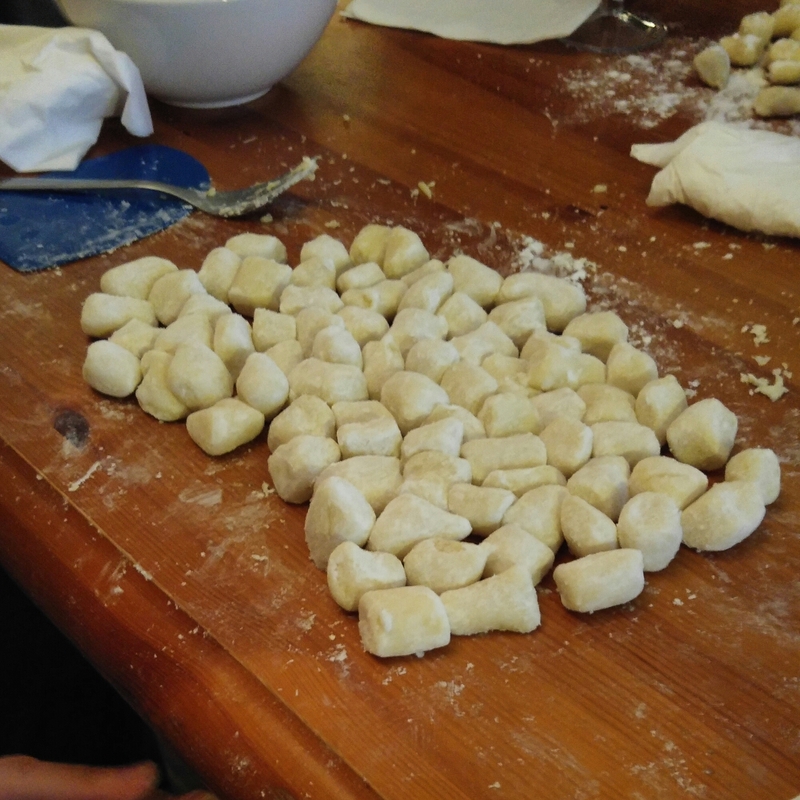 The whole process probably took about an hour, and then once we were done shaping the gnocchi into the ridged lumps we’re familiar with, she handed us all some cute little takeout boxes and silver trays. The trays were for what we wanted to eat right now, and the boxes for what we wanted to take home. She warned us that we must either freeze the leftovers immediately, or cook them and then refrigerate them. 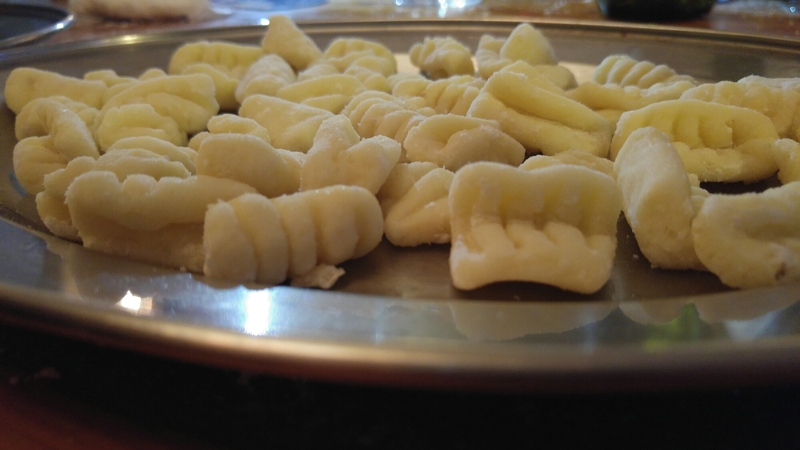 Refrigerating raw gnocchi apparently just turns it to mush. 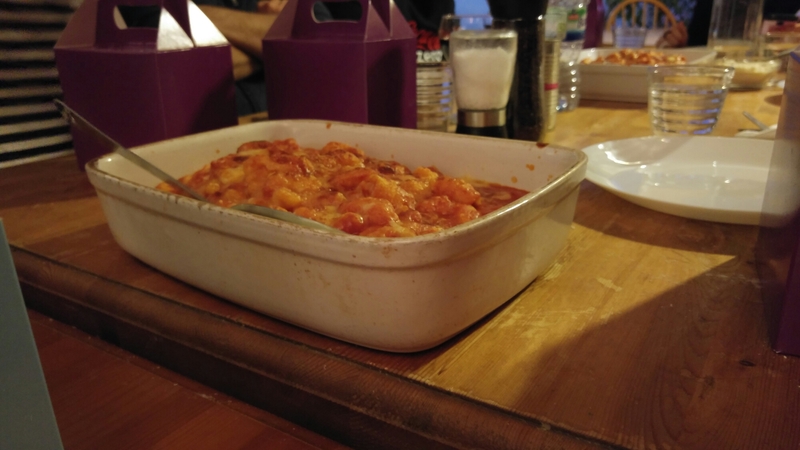 After Silvana whisked away everyone’s trays, we didn’t have long to wait before the gnocchi was returned to us. They’d been boiled and then placed in a truly amazing tomato, basil and mozzarella sauce and baked in the oven. The mozzarella was that perfect combo of stringy and crispy. The gnocchi returned in two big roasting dishes, we were all handed cutlery and a plate and told to dig in, family style. It was so good that I definitely ended up eating more than I should have. The Bulgarian’s look of absolute bliss suggested he was pretty fond of it too. 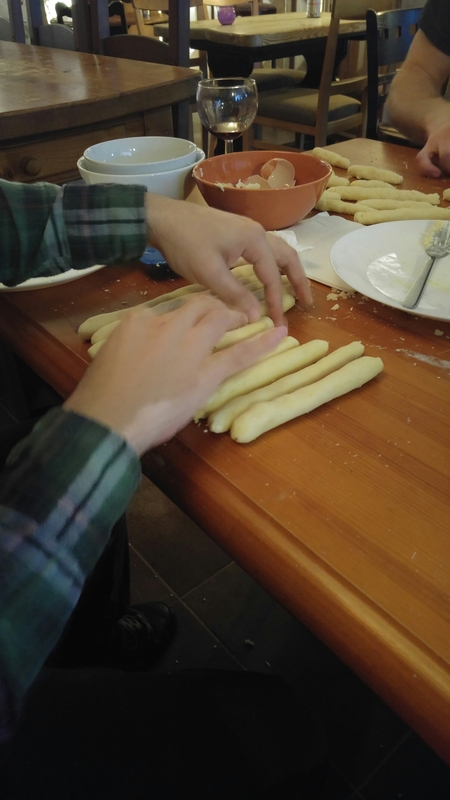 At home, I’m usually the one who cooks, because the Bulgarian’s culinary prowess usually just extends to him following me around the kitchen, eating the ingredients before I can cook them, but he said that he really enjoyed this class and wants to try another sometime. As date activities go, this was one of the nicest we’ve done, and it was such a lovely way to spend an afternoon. I honestly can’t recommend Silvana enough. If you’re looking for something fun and unusual to do with your partner, why not give it a shot?